Currently used as a 40-vehicle parking lot*, the area will be refreshed and repurposed to prioritize pedestrians and social interaction. 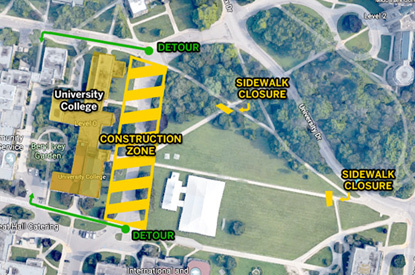 Parking spaces will be removed from atop the hill and along the surrounding roadways around University College. The enhancements will reconfigure the laneway by creating a greener space with seating for social interactions, outdoor learning space and promotion of health and wellness. The renovation will see the removal of the existing asphalt, to be replaced by attractive paving stone, creating a wide pedestrian walkway. Some areas will be reclaimed for grass and plantings and new trees. Seating will be installed throughout the area to encourage use of the space for socializing and leisure activities. A new stone retaining wall will be constructed along Kent Drive, at the base of University College. During construction, pedestrian traffic will be redirected to the perimeter of the work area and along the west side of the building. The project should be completed by September. For the past two years, construction has been underway on the inside of University College which will maintain and enhance the historical features of the building, while bringing the mechanical and electrical systems into the 21st Century. The Faculty of Arts & Humanities will begin to return to the building in July. * (Edit May 7) Renovations will eliminate 40 Kent Drive parking spots, as well as, 18 nearby spaces for a total of 58. Some areas along Kent Drive will be reclaimed for grass and plantings and new trees. Seating will be installed throughout the area to encourage use of the space for socializing and leisure activities. 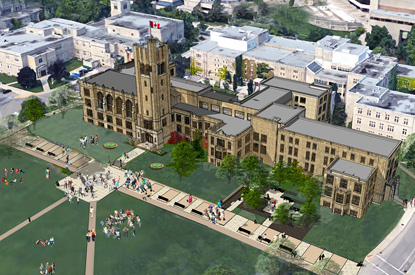 A new stone retaining wall will be constructed at the base of University College.